Welcome to the online home of Healing Stories: Picture Books for the Big and Small Changes in a Child's Life. Here you'll find information about Healing Stories, along with unique resources to support you in using picture books to help children through the challenges they face, from the everyday to major trauma. Have you ever wished that you could find just the right book for a child? Maybe a child in your life is anticipating a big change, such as having a new brother or sister, starting school for the first time, or moving to a new house. Maybe something difficult and painful has happened, such as a divorce, a serious illness, or a death. Or maybe you just know a child who is fearful at bedtime, or is a fussy eater, or has a bad day occasionally. It may have occurred to you that sharing a story could help the child in your life manage the situation that she or he is going through. Why a story? A healing story is a comforting experience. As a child, it’s a comfort to know that other kids have gone through what you’re going through - whether it’s something as ordinary as starting school for the first time, or something as traumatic as a natural disaster. It’s a comfort to know that other children have had the feelings you’re having, and that there are ways to solve the problem or to get through the situation. Most of all, it’s a comfort to share this experience by reading with an adult who cares deeply about you. And when you’ve read this healing story with your parent or another caring adult enough, the book itself - and ultimately, the story (in the absence of a physical book) - becomes a comfort. But, as a parent or other concerned adult, how will you find this healing story to share with your child? 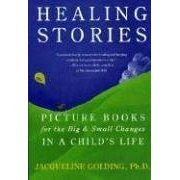 Healing Stories puts at your fingertips an annotated listing of more than 500 picture books that was prepared just for this purpose. Each story or nonfiction picture book has been carefully selected by a psychologist who works extensively with children. Each chapter includes summaries of picture books relevant to a specific concern that children may have, empowering you to select the books that best match the child and the situation you’re concerned about. Healing Stories also includes a helpful introduction that discusses ways to use books with children who are experiencing life changes or stress. Below you'll find reviews of picture books that aren't included in Healing Stories, and can be valuable sources of healing for children. Illustrated by Cozbi A. Cabrera. 48 p., Random House, 2008. Baby Girl plays under the quilting frame as the women of her family create the famous quilts of Gee's Bend, Alabama. Listening to them, she not only learns homemaking and parenting skills, but also absorbs the ability to make meaning through art. With a piece of her Grandma's dress at its heart, Baby Girl's first quilt celebrates African American people's strength, hope, and determination in the face of racism, and tells the stories of the heroes in the fight against it. This moving story beautifully stitches together themes of coming of age, the strength of community, triumph over racism, and creativity. Illustrated by Maxie Chambliss. 24 p., HarperCollins, 2005. Children may have worries when visiting their doctor for a checkup. This story provides an upbeat role model who is "just like you" in a little girl who tolerates a checkup calmly and copes successfully with the pain of an immunization. It explains what happens at a well-child visit and why, in age-appropriate ways that reflects children's perspectives. For example, when the doctor palpates the child's belly, she says, "That tickles." The upbeat, gentle illustrations and direct, often humorous text (the doctor looks in the child's ears, asking if she has an elephant in there) make it clear to kids that they can feel safe and comfortable at their checkup. An afterword for parents describes ways to support children in coping with any stress they may feel around physician visits. This book can help make it easier for children to manage visits to the doctor. Illustrated by Carol S. Carter. 32 p., Whitman, 1998. A second-grade girl named Amanda explains that she has a vision impairment and tells its history. She describes both the ways she copes with it (using Close-Circuit Television to enlarge letters in books, learning Braille, regular medical checkups, physical therapy to address difficulty with balance that's due to limited depth perception) and the everyday things she enjoys (shopping for food with her mother and sisters, going to slumber parties, having her father read to her). Photographs illustrate the contrast between ordinary vision and Amanda's perception. Amanda tells about other kinds of visual impairments and the ways kids cope with them. Acknowledging that she doesn't like being vision-impaired, by admiring both famous and everyday people who have vision impairments, she remains genuinely optimistic. She also acknowledges her personal strength. Realistic, informative, and positive, this story can help both children who have vision impairments and to those who could benefit from understanding others' difficulties with seeing. When children are feeling unhappy, it's easy for them forget what makes them feel good. With a suggestion on each page, this book is full of wonderful reminders. These include telling yourself you're cool, thinking positive thoughts, speaking up for yourself, and asking for help; having fun by playing outside or having a party; and taking good physical care of yourself by getting good sleep and exercise. The author also encourages kids to have positive interactions with others, to soothe themselves, and to reassure themselves that they're loved. Many of these ideas may be helpful for kids who are feeling angry or worried, as well as those who are feeling sad. And it's hard to be unhappy when you look at the brightly-colored illustrations. Not all of the ideas will work for all children all the time, but this "coping tool kit," provides lots of constructive places to start. Illustrated by Angelique Benicio. 52 p., Safer Society, 2009. When children have been sexually abused, they may feel fearful, ashamed, guilty, sad, and different from other kids. As this story opens, elementary-school-age Sarah, who has been sexually abused by her stepfather, describes these feelings. Written in the form of her journal, Sarah's Waterfall chronicles her healing from this traumatic experience. Sarah's mother has died, and she lives with her Gram. Sarah is safe with Gram, who reassures her that she is beautiful and good. When Sarah is sad, Gram assures her of her devotion to her and her willingness accompany her through the process of her recovery. Gram also provides a loving, ordinary life for Sarah, playing cards with her, taking her to museums and out to lunch, and taking care of her when she has a cold and when she needs glasses. Sarah also participates in a group for sexually abused girls that is led by her school psychologist, Mrs. Bell. The group does exercises to help work through their painful feelings and to learn to feel strong again. One of the most significant for Sarah is drawing; in particular, drawing what it feels like to feel clean. In the group, Sarah meets a new best friend, Paula, who is also a wonderful source of support. By the end of the story, Sarah has moved through her fear, shame, and aloneness, and is taking delight in everyday things. This story can be a source of empathy, support, and hope as children recover from the trauma of sexual abuse. Jacqueline Golding, Ph.D. is a psychologist in private practice in Pleasanton, California who works with children, teens, and adults. A graduate of Yale University, Dr. Golding earned her Ph.D. in psychology at the University of California, Los Angeles and completed a post-doctoral fellowship at the Central Contra Costa County Child, Adolescent, and Family Mental Health Service in Concord, California. She holds an appointment as Professor Emeritus at the University of California, San Francisco and has published over 100 articles in scientific and professional journals on topics such as trauma, depression, and cultural issues in mental health. Dr. Golding is represented by the Levine Greenberg Literary Agency.